A free circular walk over 4 miles to look at some of the industrial and archaeological heritage of Stanton Moor. All welcome, but dogs must be kept on a lead because of grazing sheep. This easy grade walk will start at 10.30am (make sure you remember to turn your clocks back the night before!) and will involve a fairly gentle walk around and across Stanton Moor. The moor itself lies at 280 – 323m above sea level, so is relatively flat. The only significant ascent and descent involved will be when we drop down off the moor into Stanton Lees Quarry, and then have to climb back up again (about 100m of ascent). As there is so much to look at, the walk is expected to last about 4 hours, so you are advised to bring a packed lunch and a drink. This walk is open to all – not just PDMHS members – and no pre-booking is required. However, it is weather-dependent, so if you contact us in advance to register your interest, we can keep you informed of any changes or cancellation in the event of bad weather. You can contact us at meets@pdmhs.com or phone Chris on 01246 208656. Any changes due to weather conditions will also be posted on this website, so it is advisable to check back here before you set out. We will spend much of this walk looking at some of the large gritstone quarries that grew up from the 1850s around the edges of the moor, including New Park Quarry, Stanton Moor Quarries and Stanton Lees Quarry (the site of a famous six year occupation by environmental protesters when the owners wanted to reopen it). Most of these quarries had closed by the 1940s, but there is still much to see in the form of ruined buildings, crane platforms, abandoned millstones and plenty of inscriptions in the rock. And if you don’t know what revetted spoil heaps are, we’ve got some very fine examples to show you as well! We will also see several features resulting from the “improvements” carried out in the C19th, when the moor was extensively planted, and drives were created for visitors to admire the scenery from. These features include the Reform Tower and several ornate inscriptions in natural rock pillars. The trees planted at that time also gave rise to another (short-lived) industry – forestry. During the First World War, the moor was clear felled to provide timber for the trenches, and we will look at the remains of a small sawmill and light railway used for transporting the timber. For the more adventurous, there are also several natural gritstone pillars and outcrops – some of which can be climbed using steps that have been cut into the gritstone, or iron rings that have been hammered into them. 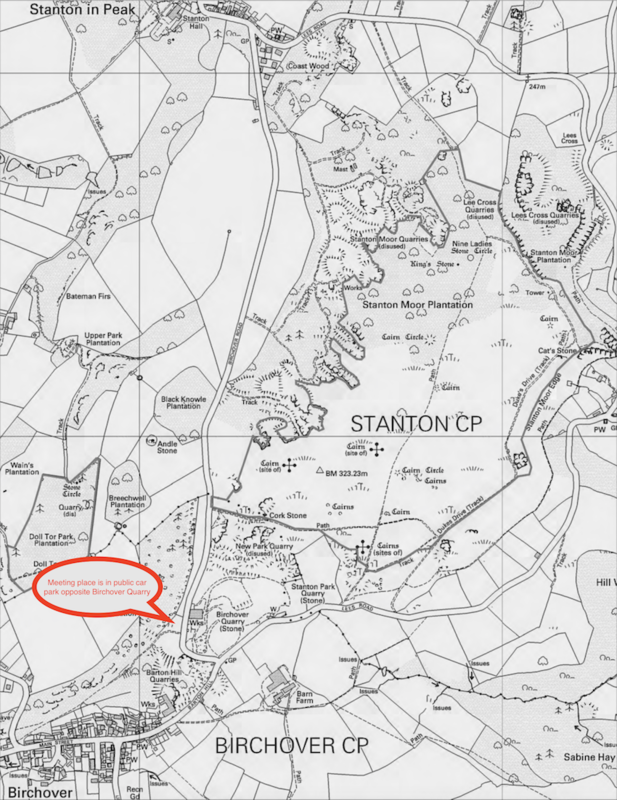 On top of all that, Stanton Moor is internationally important for its Bronze Age remains, including the Nine Ladies stone circle (which we will visit), and over a hundred funerary cairns – several of which we will also pass on this walk. 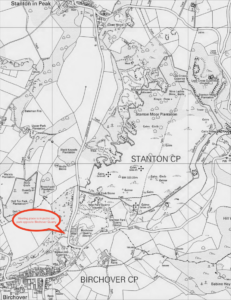 You can find plenty more information about Stanton Moor and its heritage in the Management Plan drawn up by the Peak District National Park Authority which is available for download in PDF format here (file size is 2.3MB).